Stoke City ended their six-game winless run as they clinically punished two moments of slackness from play-off chasers Nottingham Forest. City went ahead from a swift counter-attack when Joe Allen sent Tom Ince away down the right, and his pass inside allowed Peter Etebo to run on and smash a shot past Costel Pantilimon from the edge of the box. 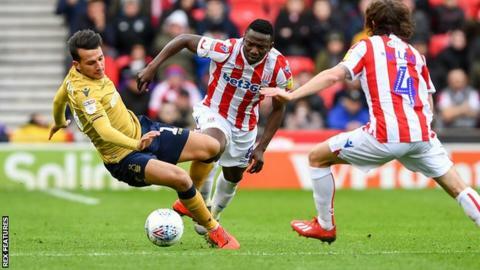 Joao Carvalho then lost possession, allowing Ince to pick out the run of Benik Afobe as the visitors switched off, and Stoke's leading scorer smashed in his ninth goal of the season. Forest's first defeat in five matches saw them miss a golden chance to strengthen their play-off chances as two of their rivals for sixth spot - Derby County and Birmingham - both lost. The Reds went into the game buoyed by victory over fierce rivals Derby and plans to expand their City Ground home, but there was little spark in front of goal as they failed to score for the seventh time in their last nine away trips. The Potters themselves had scored just five league goals in 2019, and their openings were also rare as both sides cancelled each other out. But City were ruthless when their opponents switched off - with Ince the architect of both moments - to earn their first win against Forest since October 2003 and only their second in their past 11 league meetings. The visitors have never won at the Bet365 Stadium and their disappointing afternoon was capped off when assistant manager Roy Keane was shown a late yellow card as Forest's frustrations grew. City's second win under Nathan Jones in his ninth league match in charge lifted them to 16th, while Forest stay ninth, four points outside the play-off places. "The last three games we have gone in at 1-0 up and then we haven't quite got that second goal, so it was really pleasing to get it. It gave us a cushion and probably we could have got more; we were a real threat from set plays. "As a team we pressed at the right times, we had better energy, we were far less passive and more on the front foot and we are going to get better. "I'm not content with that performance. I'm delighted we have had it and delighted we have had the win, but I'm not contest because we want to control games, we want to be a side that dominates games and God willing we will get there." "They (Stoke) played strongly, and I thought they would play exactly as they did so it was no surprise to me how strong they, physically, but I was hoping that we would be ready for it after our result on Monday evening, but no, we were beaten today. "I didn't think that there was an incredible amount between the teams. I thought that Stoke played strongly, it may well be their best, but I'm aware of their ability and I just thought we looked a bit leggy after Monday. "There shouldn't have been a reason for that as it was Monday night, but this league is really about Saturday-Tuesday, Saturday-Wednesday-Saturday, so we should be ready for that, but we weren't." Match ends, Stoke City 2, Nottingham Forest 0. Second Half ends, Stoke City 2, Nottingham Forest 0. Attempt missed. Adlène Guédioura (Nottingham Forest) right footed shot from outside the box misses to the left. Assisted by Yohan Benalouane following a set piece situation. Attempt blocked. Daryl Murphy (Nottingham Forest) left footed shot from the centre of the box is blocked. Assisted by Léo Bonatini with a cross. Corner, Stoke City. Conceded by Jack Colback. James McClean (Stoke City) is shown the yellow card for hand ball. Hand ball by James McClean (Stoke City). Corner, Stoke City. Conceded by João Carvalho. Attempt blocked. Daryl Murphy (Nottingham Forest) right footed shot from the centre of the box is blocked. Assisted by Tendayi Darikwa. Attempt missed. Adlène Guédioura (Nottingham Forest) right footed shot from the right side of the box is close, but misses to the right. Assisted by Joe Lolley. Attempt missed. Adlène Guédioura (Nottingham Forest) header from the centre of the box is close, but misses to the right. Assisted by Ben Osborn with a cross following a corner. Attempt blocked. Alexander Milosevic (Nottingham Forest) header from the centre of the box is blocked. Assisted by Ben Osborn with a cross. Corner, Nottingham Forest. Conceded by Thomas Edwards. Attempt missed. Danny Batth (Stoke City) header from the centre of the box misses to the right. Assisted by Charlie Adam with a cross following a corner. Corner, Stoke City. Conceded by Yohan Benalouane. Attempt blocked. Joe Lolley (Nottingham Forest) left footed shot from outside the box is blocked. Assisted by Tendayi Darikwa. Corner, Stoke City. Conceded by Costel Pantilimon. Attempt saved. Tom Ince (Stoke City) left footed shot from the left side of the box is saved in the bottom right corner. Goal! Stoke City 2, Nottingham Forest 0. Benik Afobe (Stoke City) right footed shot from the centre of the box to the bottom left corner. Assisted by Tom Ince. Offside, Stoke City. Tom Ince tries a through ball, but Benik Afobe is caught offside. Substitution, Nottingham Forest. Léo Bonatini replaces Jack Robinson. Attempt missed. James McClean (Stoke City) header from the right side of the six yard box misses to the right. Assisted by Charlie Adam with a cross following a set piece situation.